Conserves are jams made with a mix of fruit — sometimes even dried fruit or nuts. In other words, all conserves are jams but not all jams are conserves. Preserves have instead large chunks of fruit. Sometimes people use the term preserves to refer to whole fruit or fruit cut into large uniform sized pieces stored in its own juices, syrup or even water. Marmalades are different in that they’re soft jelly that contains pieces of fruit rind (usually citrus). They’re usually sweet and sour, and the fruit rind imparts tends to be bitter. In fruit butters, the fruit is slow cooked with sugar for a longer period of time in order to achieve a smooth consistency and dense texture. Compotes are usually made with fresh or dried fruit (whole or cut into pieces), briefly stewed and used immediately as a component of a dish. If the fruit is pureed then it’s called coulis. If instead it’s a chunky mixture it’s a compote. Now that you “scientifically” know what a compote is, let’s get down to business with this Ginger and Vanilla Bean Apricot Compote. 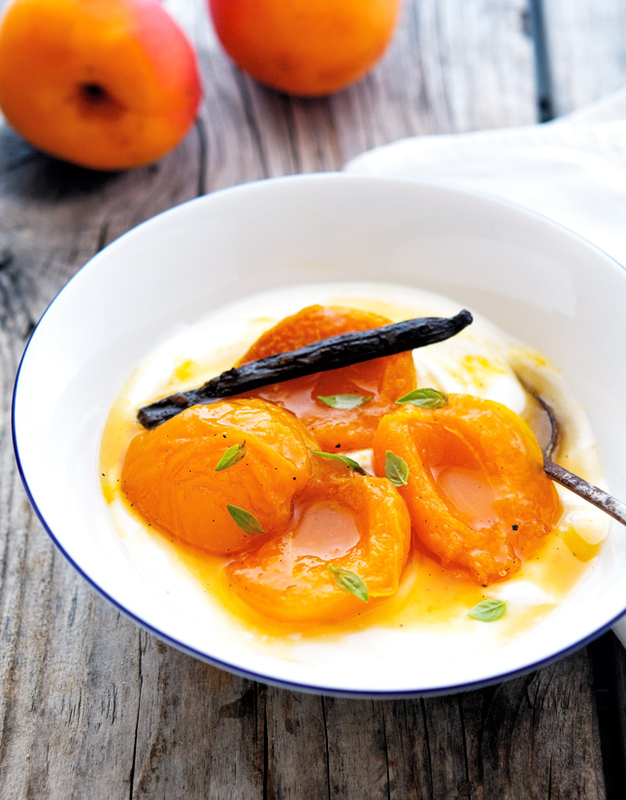 Soooo, apricots, what's NOT to love? 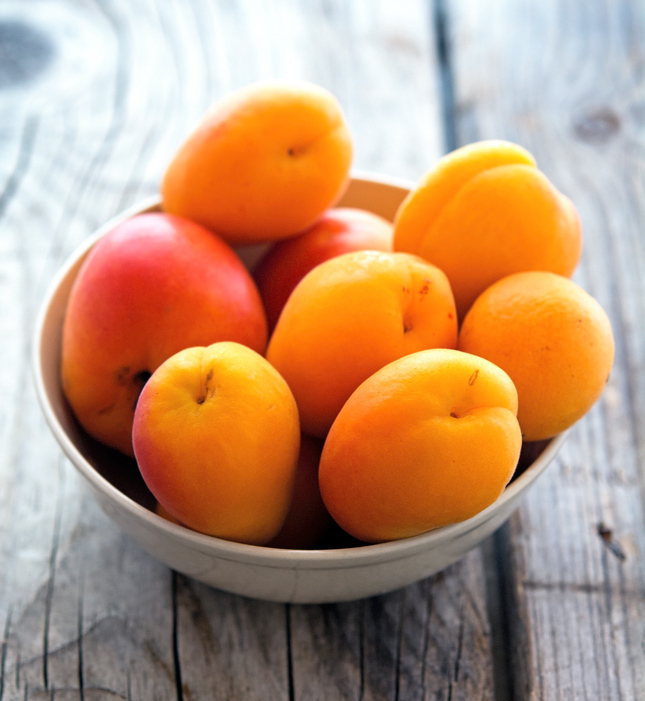 Like most fruit this time of the year, perfectly ripe apricots require very little to make them sing. A bit of sugar (or honey) enhances their natural sweetness without making them lose their distinct tartness. Vanilla adds a little complexity, while the ginger gives a bit of flare. As they cook down apricots release their natural juices and slightly soften. The resulting compote is almost too perfect for words. A fruit compote is a good thing to have on hand, especially if it's as versatile as this one. As is, you can encourage its sweetness by serving it over yogurt for breakfast or over ice cream for an after-dinner dessert. 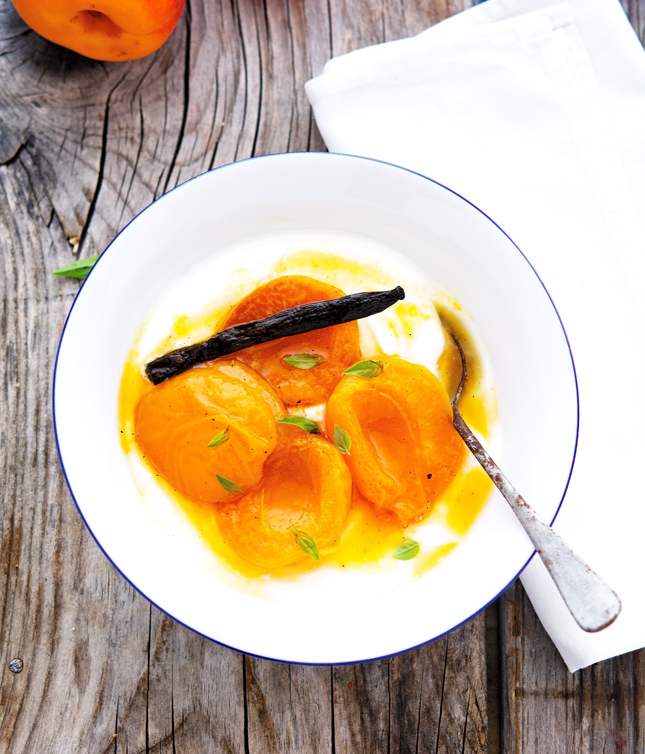 Ginger and Vanilla Bean Apricot Compote Print this recipe! Note. This compote can be made 2 to 3 days ahead. Cover and keep chilled. In a large skillet combine apricots, lime juice, sugar, ginger, seeds from the vanilla bean, and the bean shell. Cook over medium heat, turning occasionally, until apricots are glazed and syrupy, about 7 to 8 minutes tops. Transfer to a small bowl and chill. 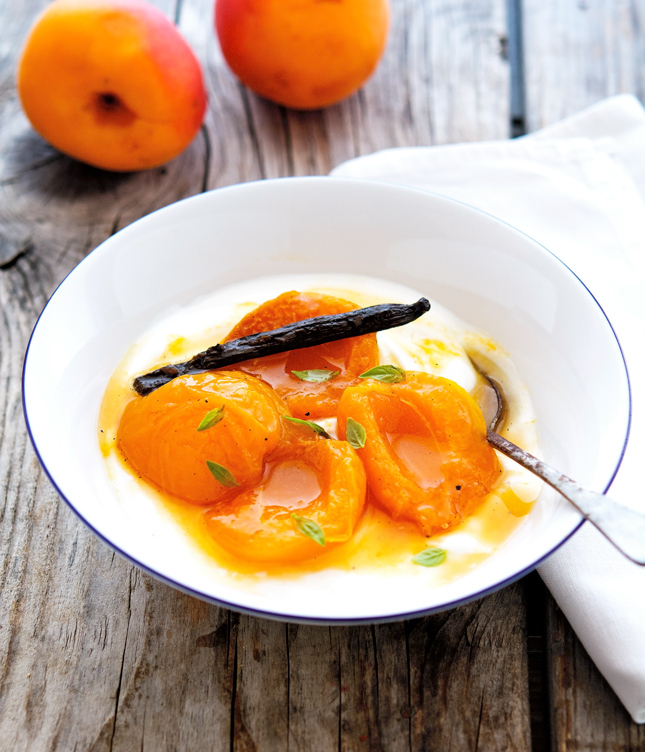 Serve apricot compote with yogurt or ice cream, and garnish with tarragon or fino verde basil leaves, if desired. One serving yields 80 calories, 1 gram of fat, 19 grams of carbs, and 2 grams of protein. Thanks for this Sally, I'll definitely check it out! As an apricot fanatic I know this will be a mainstay in our house. Gorgeous flavors and stunning pictures! I love apricots!!!! and this compote is gorgeous!!! love all the flavors you've got going on here!! elegant and beautiful! You're making me blush Alice! Looks gorgeous! definately going to give it a try soon! I know, right? Apricots are the best! I now know the difference between jams, jellies, preserves, conserves, marmalades, fruit butter, and compotes. And I feel much wiser now, than before I had read this post ;) Thanks for sharing this info! I would totally make this! Love your delicious and healthy fruit desserts, Mike! I'm kind of even embarrassed since I'm making outrageously unhealthy stuff. Perhaps I should fix it. Make this compote or those grilled peaches. Sure put them on ice cream or cake, hahah! Nice job! Stellar post - informative and I loved getting schooled! Saw this on Instagram and had to come visit. BEAUTIFUL photos and besides the killer ginger, I am digging the herb addition. Love to add herbs to desserts. Hi Mike, your compote is beautiful, love the flavors that you used here, very nice. This is absolutely beautiful - summery perfection! I've only had a perfectly ripe apricot once in my life and it was amazing - for some reason they're not really available here but I'm going to try this with peaches! That was a good lesson, a needed one. I am always confused. I grew up one and that was the jam. Amazing and so well explained Mike. I really need to get more healthy, your page always inspires me to get on tract. That is an amazing compote. Love it. The colors, oh wow. Do you think I do this with peaches instead?